www.photomacrography.net :: View topic - Small black caterpillar mimics bird dropping? Small black caterpillar mimics bird dropping? 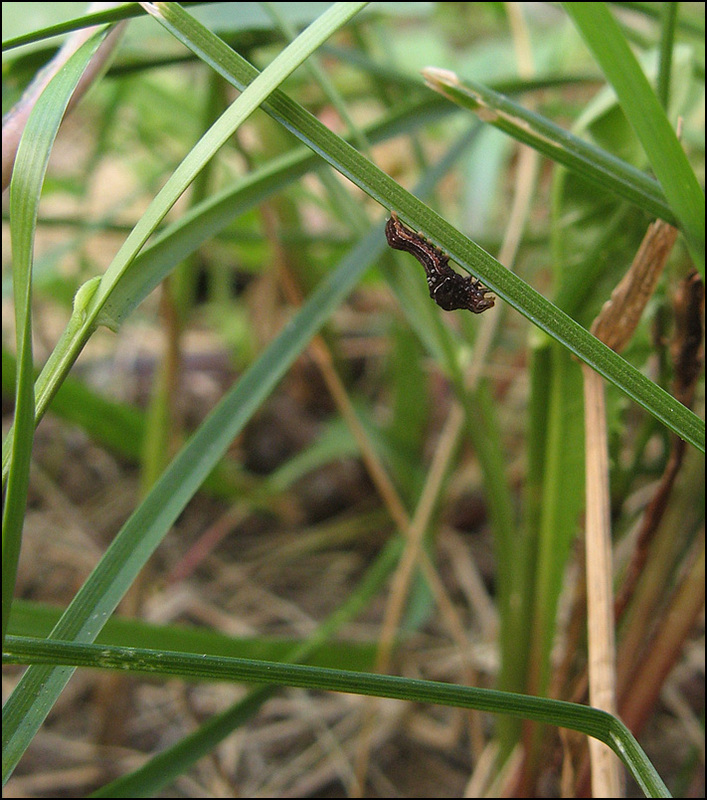 Posted: Fri Jul 16, 2010 10:02 pm Post subject: Small black caterpillar mimics bird dropping? Wandering around a back yard in White Bear Lake, Minnesota, I spied what appeared to be a remarkably small bird dropping stuck on the shady side of a leaf. Knowing that remarkably small bird droppings usually aren't, I looked closer. Sure enough it was a caterpillar, with an interesting shape that I did not recall having seen before. Now I'm not well equipped on this trip, carrying only a Canon A710 IS compact digital. But this little fellow was interesting enough that I thought I'd see what I could get. What you see here is the best of it. Let's start at the end. This is the little critter after it found a new resting place a few inches from where I found it originally. I say "resting place" because it didn't like to be in the sun, and it didn't like to be on the ground. Either of those two conditions, and it was on the run. But in the shade, on this piece of grass, it was nicely quiet. 1/40 second, f/4, auto ISO. 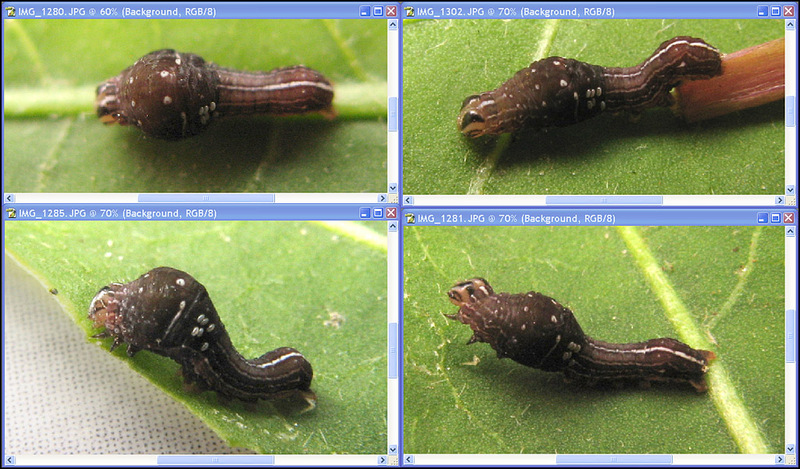 In the middle, I relocated the caterpillar to a number of different places, trying to get some decent angles on it. This one is on top of a table in the shade, shooting natural light with the camera and extended lens resting on the table. 1/15 second, f/5.6, auto ISO. Here is a variety of positions that the critter assumes. These are using built-in flash diffused through a note card, mostly at f/8. And finally a pair of shots that would be of no interest except that they happen to catch both sides of the caterpillar, showing clearly that those six white elliptical lumps we see in the first couple of pictures are not part of the caterpillar. They're probably parasitoid eggs, in which case this caterpillar is already doomed, just like 99% of its siblings. Life is tough when you're one of these critters! Hope you find some piece of this interesting! 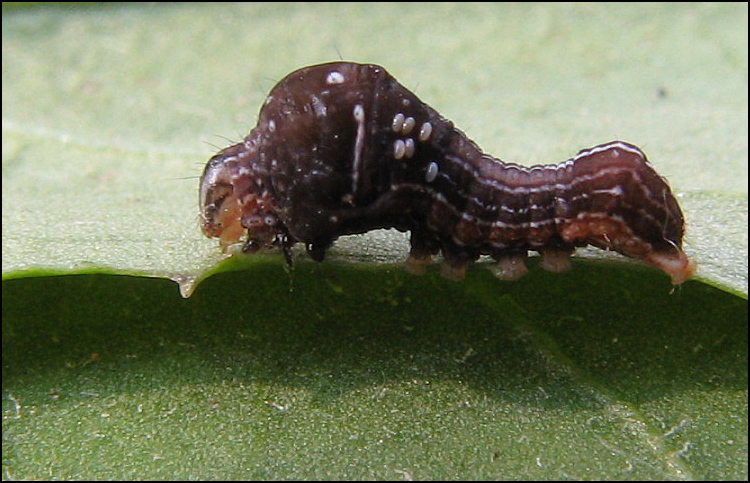 The larvae of Thyatira have a similar humped shape. Thanks, Harold. I have no idea what this critter grows up to be. Interesting documentation of insect behavior. I wonder if all of us who hang around on the forum have some sort of visual preference for the tiny. I find myself lurking around the plants looking for subjects or interesting compositions. Beats me, Roy. I like sweeping vistas too, but bugs resting in the shade are a lot easier to get to! I too look more closely at bird droppings these days, one never knows. Interesting looking little creature and complete with parasites. You have to feel for these creatures, as you mentioned, "life is tough" for them. As for a diffuser on a point and shoot, I sometimes use a couple of layers of frosted scotch tape stuck over the flash lens, seems to work well for me at times, though remember to remove it after use or it gums up the flash lens. Great post! The deal on this camera is that at extreme close focus, the subject is completely shadowed from the flash by the lens housing. Adding diffusion right at the flash doesn't change that. Worse, part of the visible background is not shadowed, so left to its own devices the camera produces an almost black subject surrounded by an arch of bright background. To properly illuminate the subject, it's necessary to bounce or diffuse the flash so that it "reaches around the corner", while also doing something about that very bright background. Holding a notecard just in front of the lens lets enough light through to illuminate the subject and also shadows the background. The trick takes a bit of practice and looks pretty weird, but it works OK.
Ah I see what you mean. I too have encountered that delima at closer than average distances. Good idea never thought of that myself and probably missed it being mentioned, if so, in other posts as well. See, you learn something new around here every day, well at least I do.